I love a bit of horseradish, me. Grated fresh and mixed into mayonnaise it does wonders for grilled mackerel. Or creamed and added to English mustard, it really makes your sausages sing. 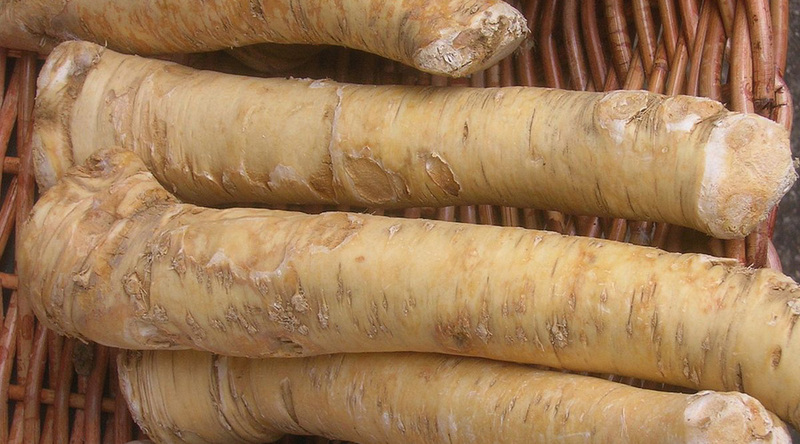 The thing is though, when you try to buy fresh horseradish, it’s only really available as a whole root about a foot or so long, which frankly is a bit too much even for me. So I decided to grow some of my own, in the hope of being able to harvest it in smaller portions. 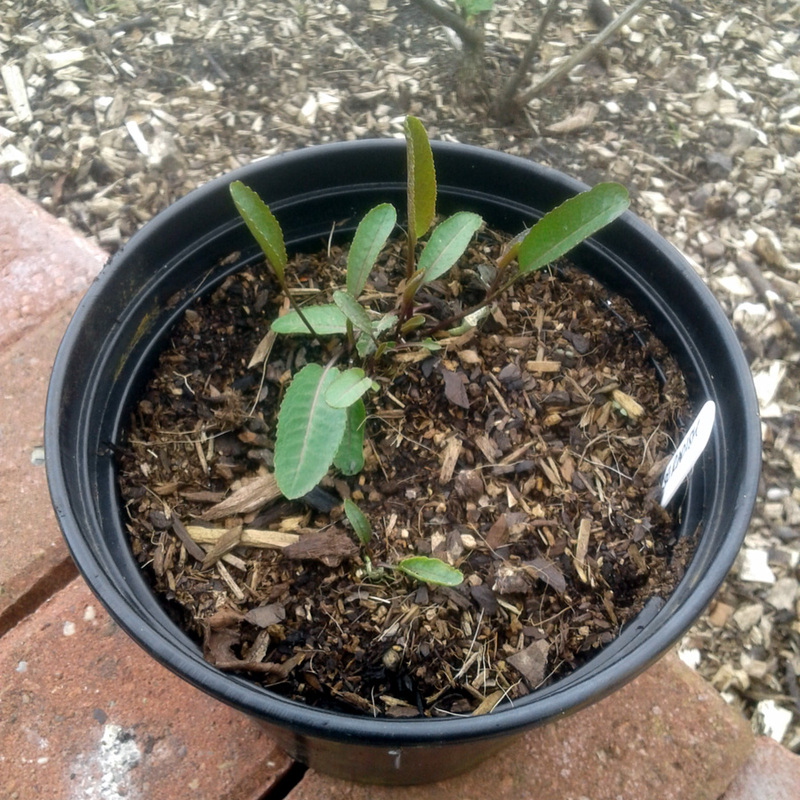 A small plant now, but give it time and it will grow in to a bit of a monster. Unassuming little thing, isn’t it? But it’s incredibly vigorous and will spread itself around by sending out underground stems (rhizomes) and colonising nearby growing space, especially if its roots are disturbed. And as harvesting the fleshy tap-root is the whole point of growing the stuff, if you don’t want it to take over half your plot, you need to do something to contain those rhizomes. 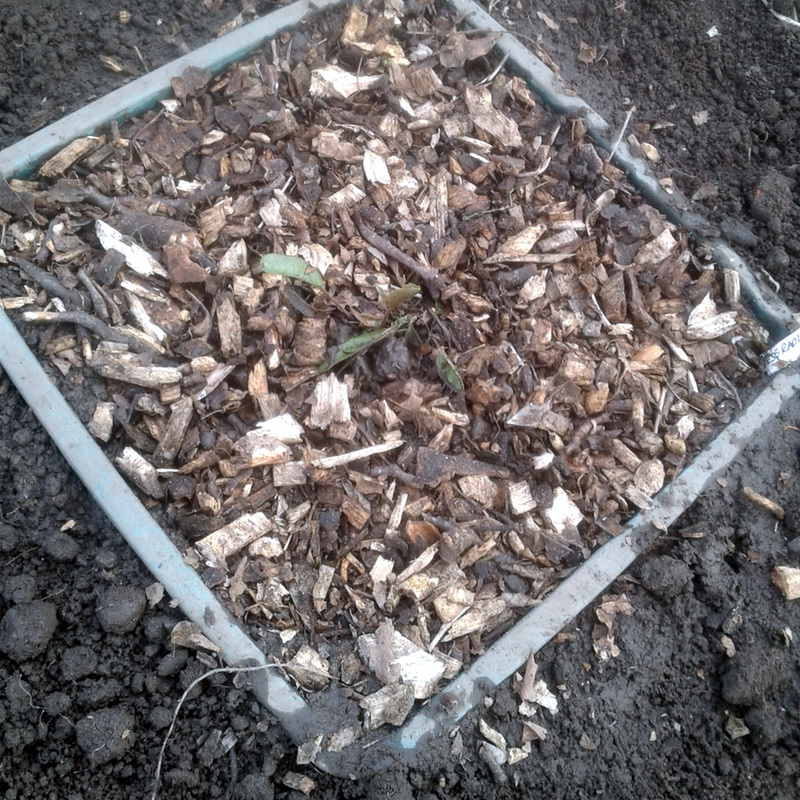 I’m hoping the depth of this old bin will be enough to contain the horseradish rhizomes. I’m hoping this will be enough space for the plant to grow well, without taking over the entire plot. Job’s a good ‘un. I’ll leave the plant alone to establish for a while, but with any luck I’ll be harvesting horseradish before the end of next year. Here’s the rough draught Plot #59 plan – subject to change as the year goes on, no doubt. Click for the full-size version. A slightly belated Happy New Year, everyone! And welcome to what’s shaping up to be a proper January. With the weather veering between heavy frost and soaking rain, it’s a far from good time to be working the ground – risking soil compaction and water-logging to follow – but with the crops mostly long-harvested and the weeds mostly dead, or at least dormant, it’s a great time to cast an eye over the plot as a whole, and think about the work that will need to be done in the year to come. At the start of last week the air was bitingly cold and the pavements were treacherously icy, but a burst of afternoon sunshine lured me out of the house for a wander on down to Plot #59. I left the fork and spade and home, taking along my camera, notebook and pen instead. I then spent a happy hour or so pottering up and down, taking reference shots of the main ‘sections’ that the plot was unofficially divided into last year and making notes of jobs to do. So rather than post a December 2016 update (we didn’t get much new stuff done on the plot last month, just more of the same November jobs) I thought I’d instead share the output of my pottering session: the reference shots and the thought processes that arose. The end result ought to give you (and me!) 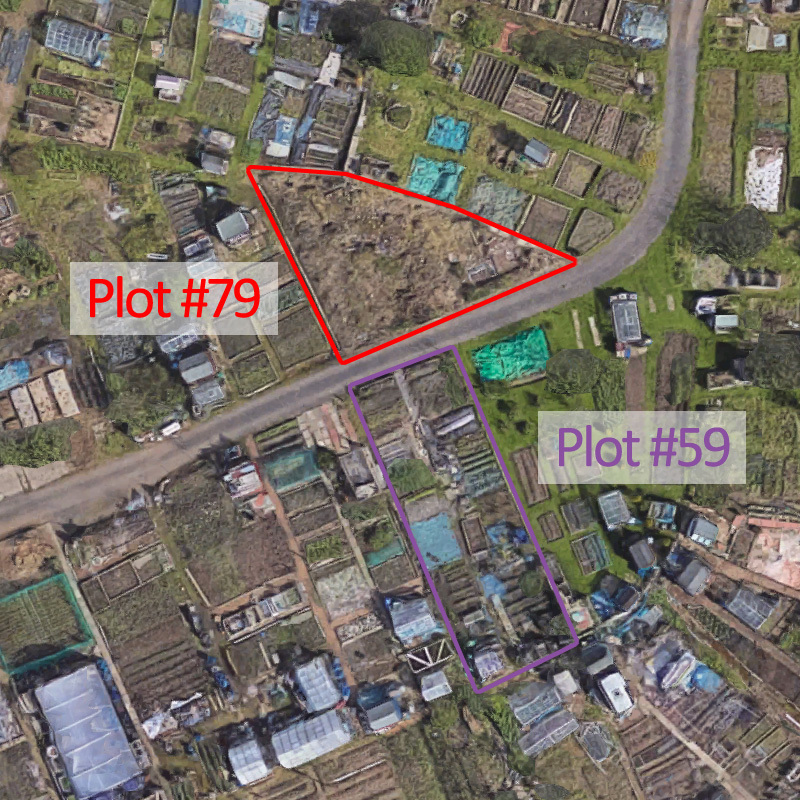 a glimpse into the extent of the Plot #59 to-do list, as well as an idea of the volume of work needed to get a full-size plot ready for the growing season. Our plot is a full-size one, roughly 10 poles (in old money) or around 250m2 (the actual dimensions are 9.5 x 27.5 metres or thereabouts). Based on these pics it can be divided into roughly sixteen sections, eight either side of the (to be completed this year) central path. 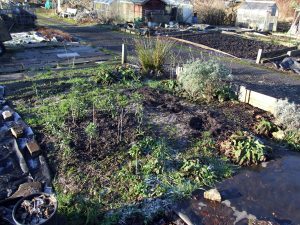 We’ve always planned for the allotment to be a space to grow flowers as well as edibles, partly for their own sake but mainly to attract pollinators to the plot. As well as the welcome beds across the front of the plot, we’ll be establishing a strip either side of the main path – around 75cm or so wide – and Jo will be filling it with a mixture of perennials and annuals as the year goes on. We do move crops around from year to year – it’s important to avoid the build-up of crop-specific pests and diseases in the soil – but don’t have a strict crop rotation system in place just yet. 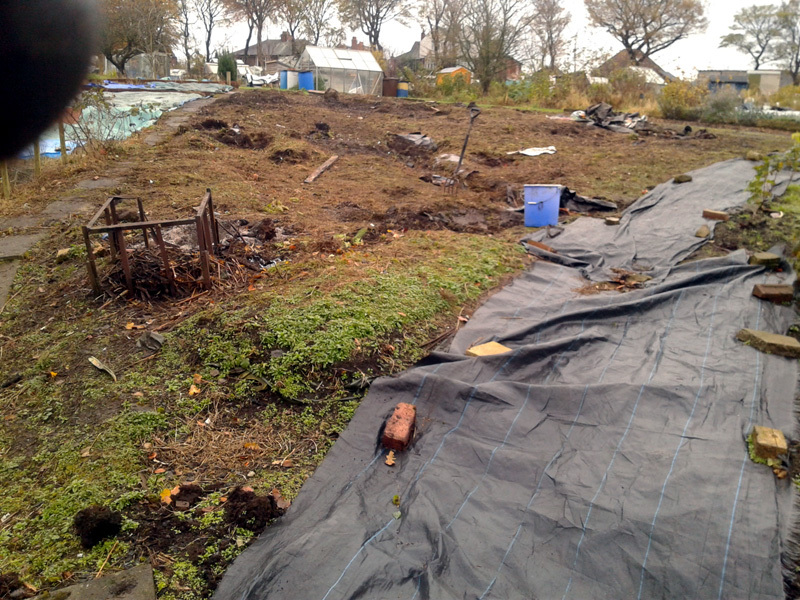 The reason being that after three years of working Plot #59 we’re only now getting to the stage where we’ve cleared all the problem areas – perennial weeds, rubbish middens, tree stumps etc. – and can cultivate pretty much the whole plot, but so far we’ve grown where we’ve had space to grow and rotated as best we can. If any of the follow-on crops mentioned below don’t fit the textbook rotation system, that’ll be why. This front-left section was where we grew in a ‘three-sisters’ system last year: squash, sweetcorn and climbing French beans. They all did reasonably well and we ended up with a decent squash harvest and some lovely sweetcorn. The key was to keep on top of cutting back the rampant squash foliage to stop it smothering everything else. The section was heavily manured last winter, so shouldn’t need re-fertilising, and will be suitable for growing spuds this year. Re-weed (we didn’t get covers down early enough). Flatten last year’s growing mounds, level off the section. Dig trenches for the spuds once they’re chitted (March), unless they’re station-planted for a change. Last year’s onion and garlic patch, currently a nursery bed. The front-right section started last year as the leek, onion and garlic patch. Once the onions were all lifted (early June or so) they were replaced with dahlias (which is what you’ll see in most of the pics from last year’s summer-onwards monthly updates) and it’s currently a nursery bed for a few flowering perennials that Jo’s growing on from seedlings or cuttings. Some of the alliums suffered from white rot, which means we can’t grow onions etc. in this section for the next few years or risk a recurrence. This year we’ll be using this section and he next one for our ‘three-sisters’ patch, plus an extended winter squash section. With that in mind, the soil will need plenty of feeding as soon as it’s workable, and then mounding up once we’re ready to plant out. Last year we had six mounds and a dozen squash plants. The sheer volume of squash foliage combined with the warm, wet weather meant we lost a lot of the fruits before they set and grew to a decent size. This year: four mounds, and only eight squash plants. The section will be fallow until then, once the flowers have been relocated, so it will need to be covered. Or perhaps we could use it for a catch-crop of early summer salads or radish. 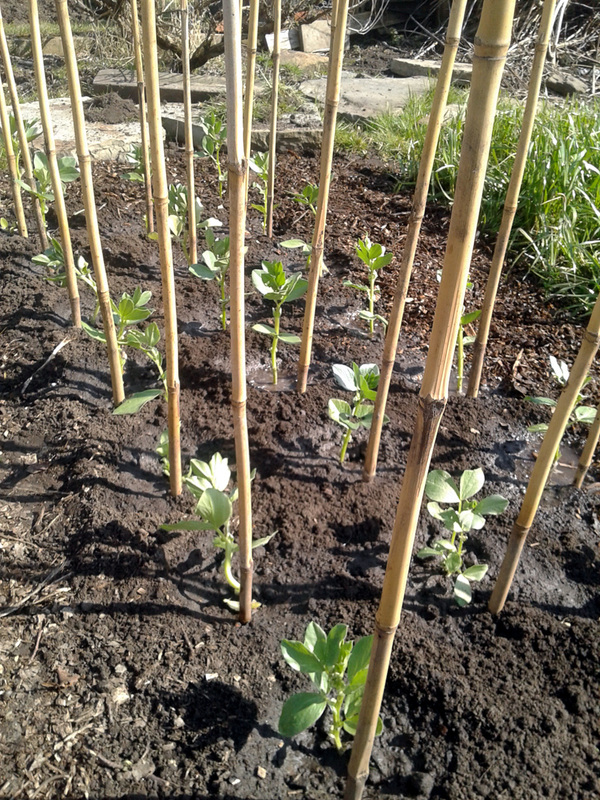 Maybe another patch of an early, fast-growing variety of broad beans (good nitrogen fixers). Re-weed (it’s been hoed over a few times, but the Poa annua grass persists). 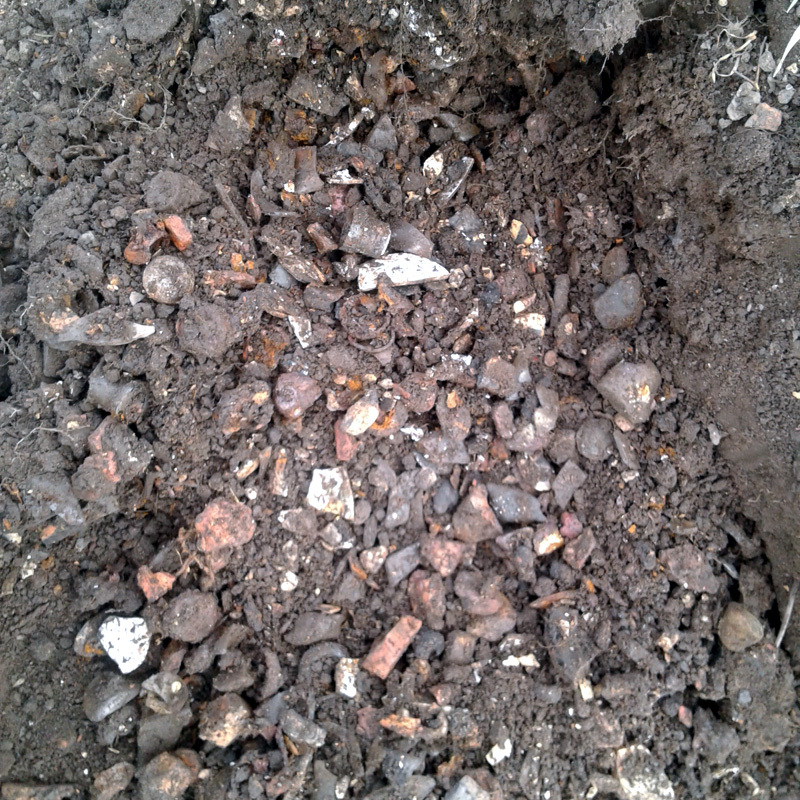 Dig over and improve with well-rotted farmyard manure. 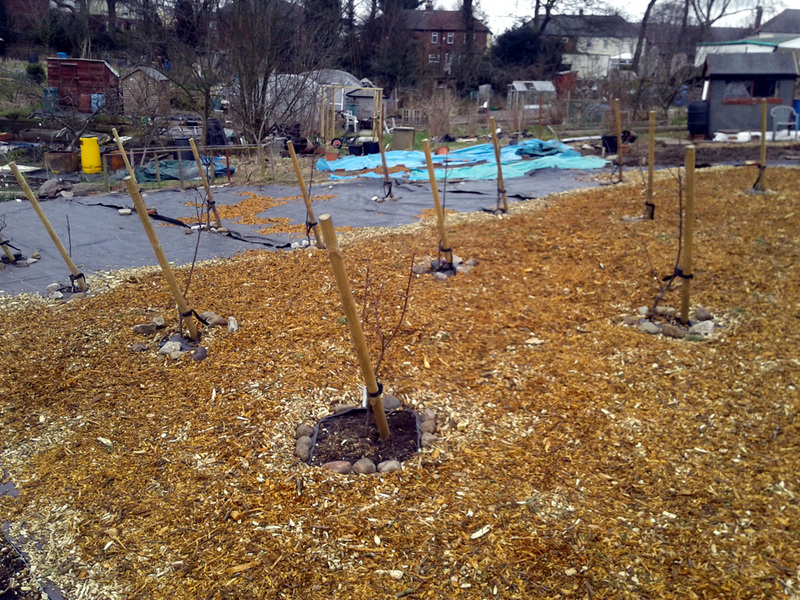 The asparagus patch, with its covering of leaf-mulch. We put a lot of work into setting up our asparagus beds last winter and spring (see blog posts, parts one, two, three and four, if you’re interested). The plants all seemed to grow well, putting up a decent succession of stems and masses of frondy foliage, which I cut back in November, adding a thick leaf mulch to the mounded rows afterwards. Next to the asparagus, we have the raspberry section. Again, it’s low-maintenance and was heavily mulched with wood chip last year, so aside from thinning out the canes if they grow too vigorously, there’s little to do here until harvest time in late summer and early autumn. Those pots in the foreground will be heading home at some point, once Jo needs them for planting out annuals. Keep an eye on the asparagus patch leaf mulch, make sure it doesn’t dry out and blow around. 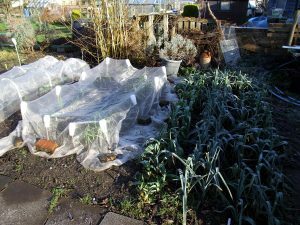 Site of last year’s broad beans and peas, covered for a while now. Here’s where we grew our broad beans and peas last year. They did very well; the peas in particular romped up the pea-harp that we set up for them. We’ll definitely be using the same method for both edible and sweet peas this year. As they’re good nitrogen fixers, the soil shouldn’t be too depleted, but it will still get a general feed of fish, blood and bone once it’s weeded. As mentioned above, this will probably be the main ‘three-sisters’ section this year, so it will need plenty of feeding. And memo-to-self: this area liberally scattered with self-sown nasturtium seed-pods last year, so we’ll have to keep an eye out for seedlings as they come up. Either that or let them grow a while and then dig them in as green manure. Clear away any persistent weeds from under the tarp. Feed with well-rotted farmyard manure. Cover over until ready to form up the mounts and plant out the crops. Weed out nasturtium seedlings as they appear, or dig in en-masse in due course. 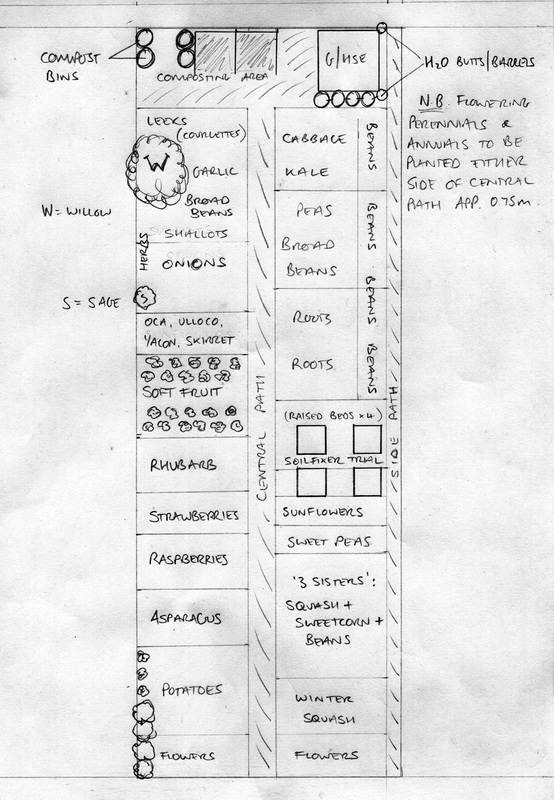 Strawberry and rhubarb sections, with last year’s crap collection in the foreground. Another two semi-permanent crops here: strawberries and rhubarb. 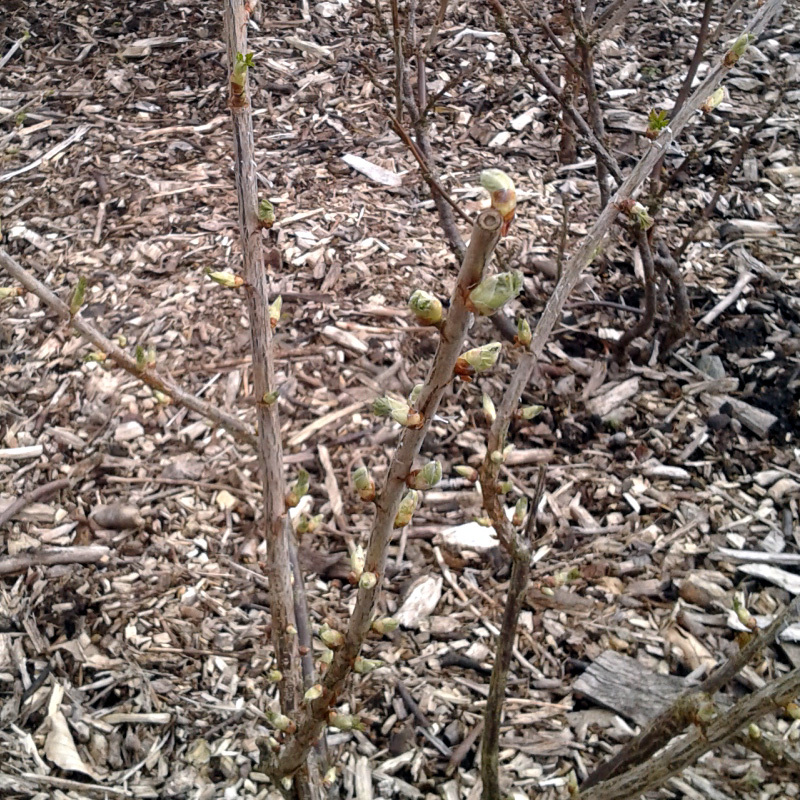 The latter is particularly easy: just enjoy the sight of the thick, green buds bursting open – always one of my favourite moments, heralding the return of spring – and then leave it to do it’s thing. The strawberries need attention though. We got greedy (okay, I got greedy) when we planted them out; they’re much too densely planted and this year we paid the price in the form of a vicious botrytis grey mould that ripped right through the patch and wiped out around 80%-90% (I kid you not) of the crop. Once the ground is defrosted, we’ll be taking out every other plant from each row, reducing the total number from 36 to 18 or 20, in an effort to improve air-flow and keep the fungi at bay. By the end of this year they’ll be over three years old. We’ll switch them out completely, move the section to another part of the plot. Most probably we’ll starting again with new-bought, named varieties. In the foreground of that pic, you can see most of last year’s crap-pile. It will (hopefully) be going in the annual skip at Easter, although we might have to get rid before then. Because under the crap-pile is the last chunk of the massive midden of broken glass, plastic, ceramics, metal, wood and concrete that I’ve been gradually clearing for the past three years. I’m determined to dig it all out before I finish off the central path. Thin out the strawberry plants. Regularly trim back the foliage if they grow too vigorously again this year. 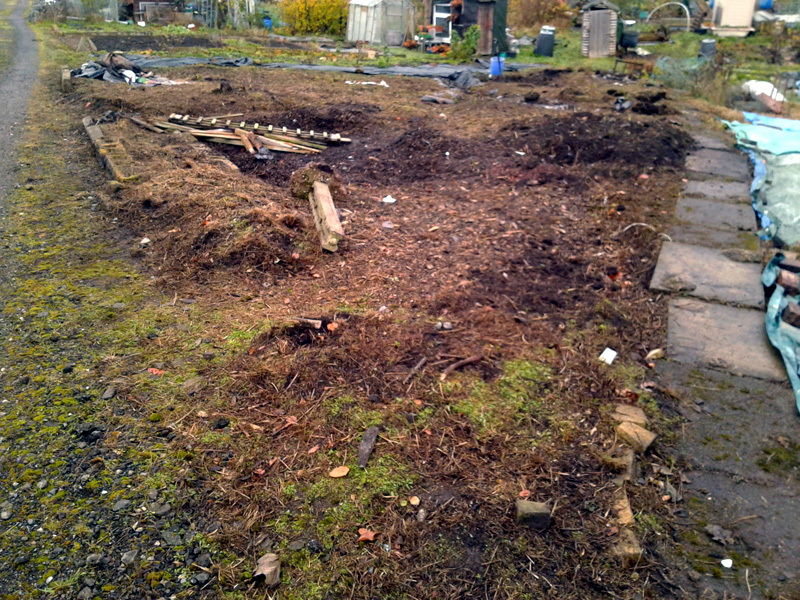 Clear out the last of the midden, level off and fill with flowering plants. This year’s root beds aren’t quite done yet. I put quite a lot of effort into the carrot and root beds last year; sieving soil into raised beds in an attempt to create the ideal growing conditions. Alas, it was largely a waste of time. I think where I went wrong was in only putting up an enviromesh barrier against carrot-fly, rather than covering the beds completely. The little bastards got it over the top and the crop was all-but wiped out; around 75%-80% of the carrots that did grow grew badly and ended up useless. Although to be fair the other root crops – mooli, scorzonera and salsify in particular – did reasonably well. I assume the carrot fly weren’t at all interested in those. 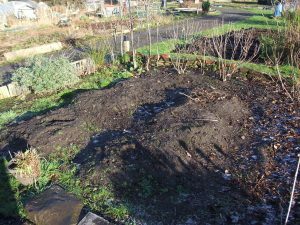 I think I’ll re-use the soil from these beds in the sections that I’m setting up for the composting trial that I’m participating in for Soilfixer.co.uk, if only because it’s of a reasonably uniform grade and I know it hasn’t had anything in it that will leave lingering diseases. Slugs might be an issue, but they’re an issue all over the plot, and I’ll install counter-measures against them. This part of the plot will then be available for growing Jo’s sweet peas and sunflowers, so it will make for a real splash of colour in the summer and hopefully attract plenty of pollinators to the strawberries and raspberries just across the path. 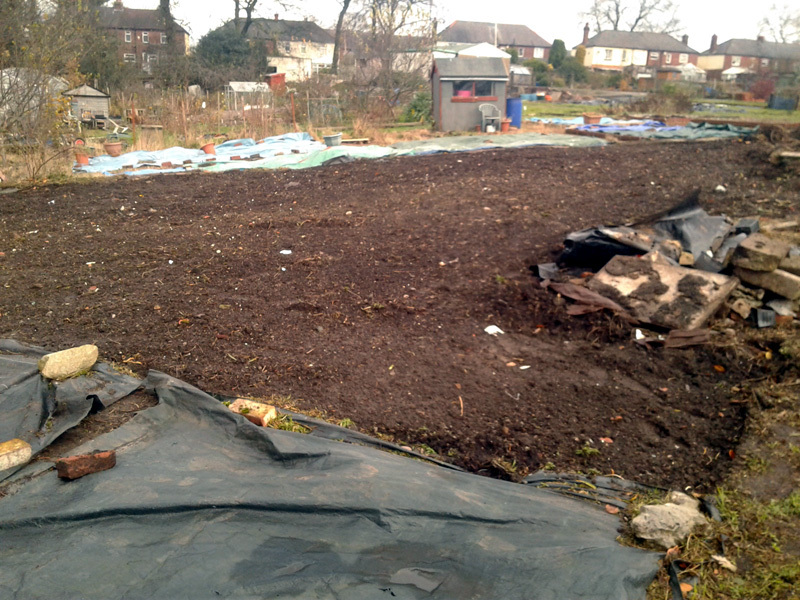 Weed and relocate soil from raised beds to trial section when established. 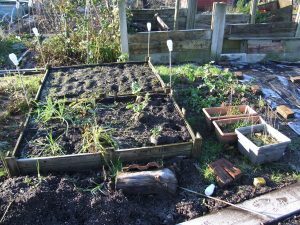 Assess raised beds to see if they’re re-usable, repair or trash as required. Level section and prepare for planting. The soft fruit section, newly reorganised and ready for another year. 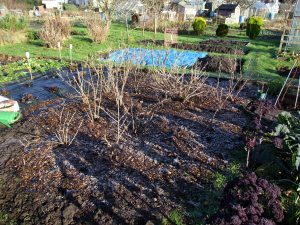 Our collection of fruit bushes – blackcurrant, gooseberry, redcurrant, whitecurrant and Japanese wineberry, so far – was pruned and reorganised back in November. I spaced out the plants and then mulched them with wood chippings, so that should hopefully be all that needs doing to them for the foreseeable. We’ll be adding a couple of jostaberry plants at some point, and I’ve bought or ordered a few interesting-sounding fruit bush seeds to try to germinate this year, so the section might expand in future. Keep an eye out for weeds. The experimental clover patch, with bagged-up leaves for leaf-mould. Here’s where we’ve been trialling Crimson and Persian clover for the folks at Garden Organic, to evaluate their relative suitability as a green manure crop. In my last update, I noted that the Persian clover section had been all-but over-run with weeds, and of course the situation hasn’t improved since. 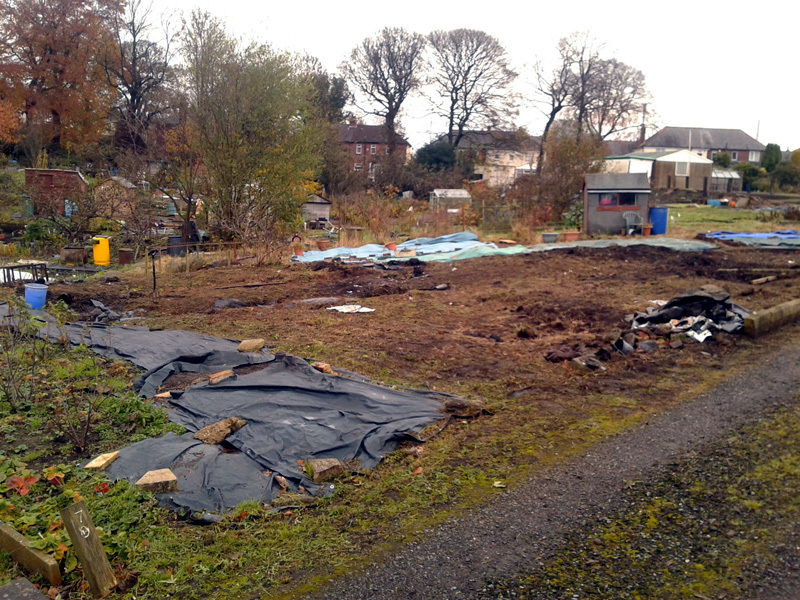 The trial is meant to last until March, but I might call time on it sooner, just to get the section cleared. This year it will be used for experimentation once again, with four 1m x 1m raised beds going in and being planted up for the compost additive trial that I’m taking part in for Soilfixer.co.uk. 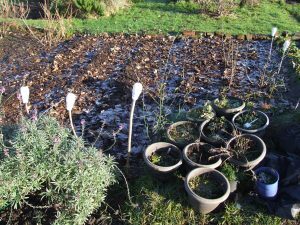 I’ll need to clear the ground – there’s a rough patch next to the path that needs particular attention – and construct the beds, ideally before April or May, when the trial crops will need to be sown and/or planted out. Clear the clover, dig over the ground to distribute the chaff and roots. Construct and install four raised beds for the trial. Fill the raised beds with the soil from last year’s root section and improve as required by the trial guidelines. Cover until ready for planting. The last of this year’s overwintering kale and cabbages, still hanging in there. Our late-planted kale and cabbages did okay last year. We’ve had a few pickings of ‘Toscana di Nero’ and ‘Redbor’ kale, and we’ll take more when they start to grow strongly again in the spring. We harvested a fair few summer cabbages from September onwards but the few that are left are most likely bound for the compost heap. The red and Savoy varieties are over-wintering nicely, we’ve been picking and eating those for the past couple of months. The first part of this section will be given over to something new this year. I’m thinking of trying a few perennial tuber crops: oca, yacon, ulloco, skirret, that sort of thing. I’m always very interested in trying out new crops and new varieties to see if I can discover something delicious that Jo and I have never tried before (although of course not everything is guaranteed to hit the spot; dahlia tubers were a slightly disappointing discovery this year, but maybe I just didn’t cook them for long enough). The ground was well-dug and weeded before the cabbages went in last summer, so hopefully it should just need a surface-skim to get rid of the annual weeds and grasses that have crept back in. 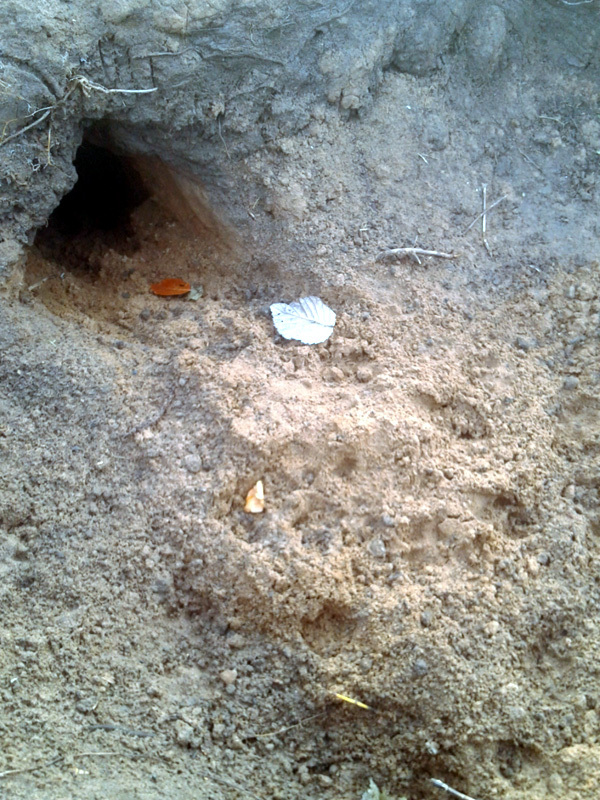 We’ll amend the soil if we need to, once we know for sure what we’ll be growing here, and what its requirements are. The back part of this section will be added to the extended allium patch; details below. Harvest edible cabbages as needed, clear un-usable ones to compost. Weed and clear the section. Research and source seed tubers for new crops. Prepare the ground as required. We went in for a range of big brassicas last year: cauliflower, romanesco, ‘walking stick’ kale and four varieties of Brussels sprouts. They were mostly a disappointment. 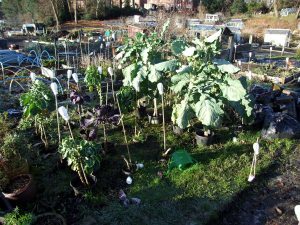 The caulis and romanesco bolted, half of the sprouts came down with clubroot and only produced buttons the size of smarties. Whilst the ‘walking stick’ kale was certainly impressive – six foot tall and three foot wide for the most part – the leaves were tough and leathery and not very appetising, at least compared to the more common kale varieties that we grew on the other side of the path. Once we’ve eaten the last of any sprouts that are actually worth the effort of harvesting – ‘Rubine’ is the one variety that performed well for us and we’ve got a couple of sticks left – this section will be cleared and prepared for this year’s role as a root bed. I won’t be going to town on sieving as much soil as I did for the carrots last year, but I will loosen the topsoil a bit and see if I can work up a nice fine tilth to sow seeds into. The right-hand strip, alongside the path between our plot and the neighbour’s, will be used to grow beans again. 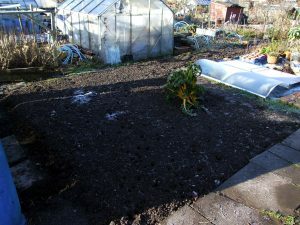 The soil will need a good feed of well-rotted manure or compost plus a sprinkling of fish, blood and bone with each plant as it goes in; I don’t direct sow my beans, preferring to start them off in the greenhouse and be sure I have enough to go around. Finish harvesting, then clear away brassica plants and collars. Weed section, lightly dig over, rake to fine tilth. Cover until ready to sow root veg seeds. 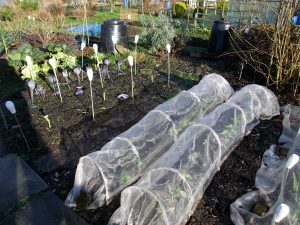 Overwintering broad beans under their fleece tunnels. This section contained another couple of rows of cabbage – long-since harvested – and as you can see we’re attempting to over-winter a dozen or so broad bean ‘Aquadulce Claudia’ under those fleece tunnels, to see if they’ll survive the frosts and provide us with an early crop. A couple of folks elsewhere on the site who over-wintered them last year had six-foot tall bean plants by the end of May, so it’s worth a shot. Depending on when the broad beans are done, we’ll most likely use the space for either a late-sown crop of oriental salads and/or late radishes. The former cabbage rows will we weeded, lightly raked and used as an allium bed for the shallots we’ve started off in modules, plus the half kilo of ‘Sturon’ onion sets that we’re expecting to take delivery of in February. They’ll be started off in modules as well, as per last year. 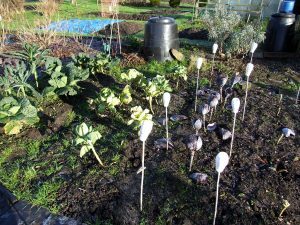 Clear cabbage plant stumps, weed, rake and cover until ready. 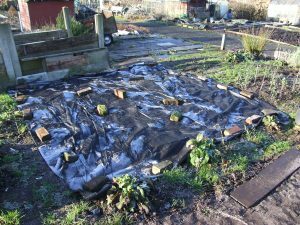 Once serious risk of frost has passed, remove fleece tunnels and tie-in broad beans to support canes. Miscellaneous pots left over from the house move, on top of the potato patch. This is where we grew our main-crop potatoes (‘Pink Fir Apple’) last year. They were hit by blight a little too early for anyone’s liking, and the ground has been left fallow since they were lifted back in July. 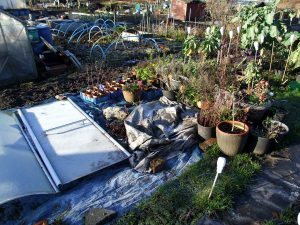 We’ve had an old, blue, plastic ground-sheet / tarpaulin down to block some of the light, but most likely some weeds will have taken underneath. With various pots scattered around (left over from the house move in 2015), there’s been plenty of opportunity for weeds to creep in and there’s a patch of rough grass growing alongside the path that needs to be dealt with. It will all need a good clear-up and sort-out before we can use this section to set up a pea-harp or two and plant out this year’s crop, along with another couple of rows of broad beans if we have the room; we can’t get enough of either of those fresh, tasty legumes come spring-time. We’ll also be continuing the bean strip along the right-hand edge, so there’s more improvement work to be done there. Weed and clear section, improve soil for bean trenches. Set up cane-and-string pea-harp(s) once plants are ready to go in. This year’s garlic crop alongside the leek patch. The final cultivated section on the left-hand side of the path contains our over-wintering leeks – which again were planted a bit late last year – and this year’s garlic crop. We should finish lifting the leeks by March or so, and the garlic will hopefully be ready by late June or early July, which means we’ll be able to used this section for this year’s courgettes. I’ll be starting some off a bit earlier so we can stagger the planting. There’ll be some weeding to do in the meantime as well, but hopefully nothing too drastic. Harvest leeks as needed, then clear and cover section when done. Feed garlic in Spring, harvest in June. Weed section and prepare for next planting. The cleared and weeded courgette section, with bean beds at the back. Back across to the right-hand side of the path, we have a lovely, clear (lonesome Swiss chard excepted) section that we’ve weeded and lightly raked already – we took advantage of a few days of cold-but-dry weather back in December – and since this pic was taken it’s been covered with a ground-sheet as well. This year we’re planning on growing kale and cabbage in this section, so once the current cold snap passes and we have a dry-ish window to work in, we’ll spread some lime and lightly rake it in, then replace the cover and leave it until the young brassicas are ready to plant out. Again, the right-hand strip will be part of the bean trench, so that will be improved in due course. Rake in garden lime when weather allows and re-cover. 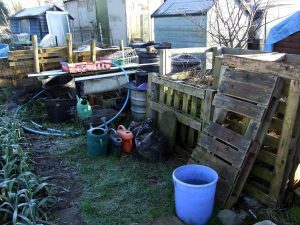 The junk corner and compost beds. 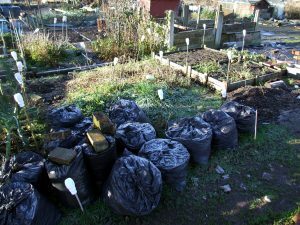 Last year the back-left section became a bit of a dumping ground for a lot of the skip-scavenged junk that I’ve accumulated since we took on the plot. 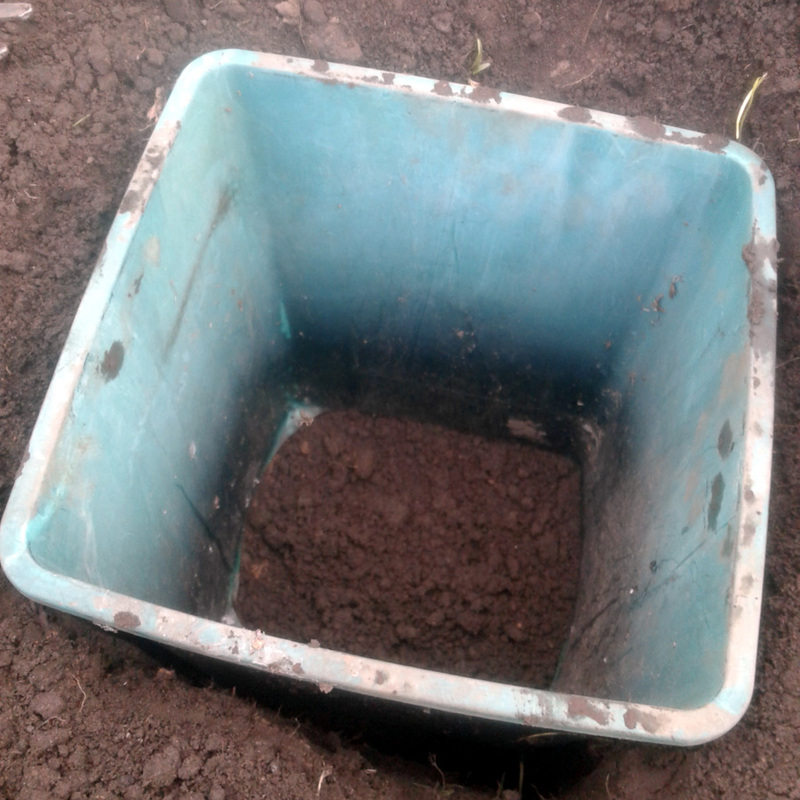 The old bath-tub that we were given by another plot-holder turned out to be less-useful than I hoped; I had grand plans to turn it into a wormery, but realised that I probably wouldn’t be able to attend to it often enough to keep the worms in good health. So that’s going in this year’s skip, unless anyone else on the site wants it. 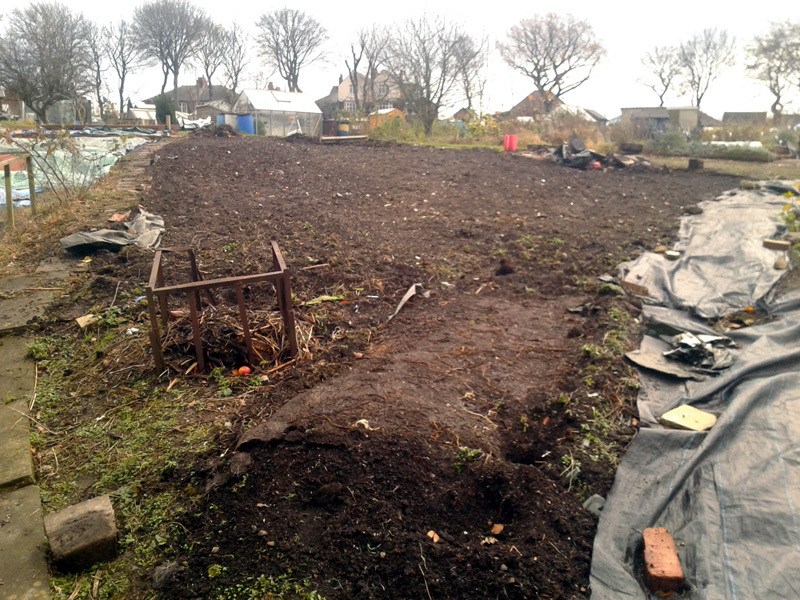 Once this section has been nicely cleared up, it will be properly organised into a highly efficient compost-making system. Green matter will be dumped in the two open bays until it starts to break down, and then will end up in a succession of dalek-style compost bins, gradually decomposing into a rich, crumbly, highly useful soil improver. That’s the plan, anyhow. As always, we’ll see how it goes. 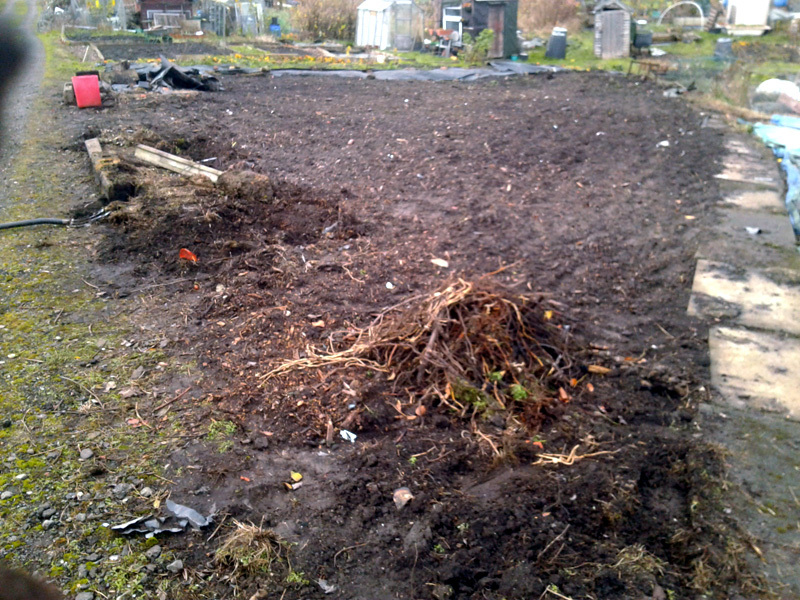 Put down weed membrane (lots of encroaching bindweed at this end of the plot). Reorganise compost bins, cutting holes in membrane as needed. In the back right corner, our 6’x6′ greenhouse / shed. When we moved house in July 2015 we brought our 6’x6′ greenhouse from the old place and set it up on the plot. We then filled it with a large portion of the contents of our old shed and it’s been in that state ever since. 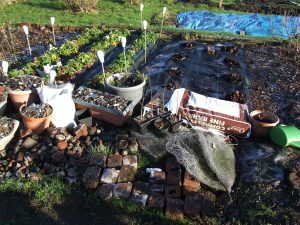 This year – and before too long, as well – it’s going to be emptied, cleaned, sorted and set up for actual growing; tomatoes or cucumbers, I reckon. Maybe cape gooseberries. We have a mega-shed at home now, so as soon as that’s emptied of the timber we’ve bought for back-garden landscaping, we’ll be able to re-fill it with the contents of the allotment greenhouse and get on with the clear-up. There’s also the small matter of the water collection system to finalise. 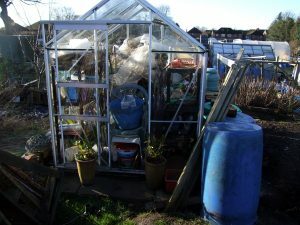 The greenhouse has two slimline water butts attached, but we’ve also obtained four large plastic drums which, once they’ve been scrubbed of algae, we can daisy-chain in to provide us with a good supply of rainwater, on the off-chance we have a dry summer (or Spring, or Autumn) this year. Remove weeds, disinfect and scrub glass. Reorganise shelving, re-stock with plot essentials. 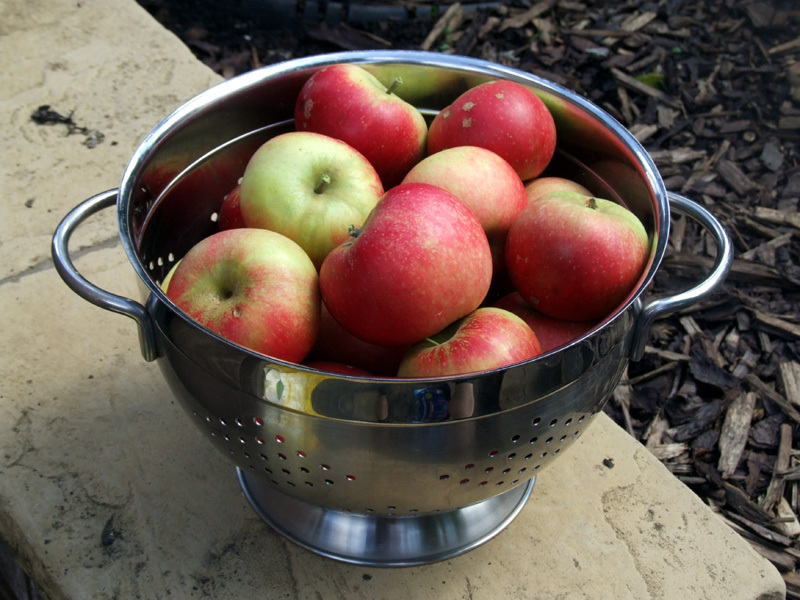 Connect plastic drums to water butts, add taps as required. So, there you go. All of the above, ideally to be done in stages over the next three or four months, ready for planting season to begin in earnest round about May and June. Thank you for reading all this way (or for scrolling through to look at the photos). If you have any comments, questions or suggestions, please do leave them via the form below – or drop me an email if you’d prefer – and I’ll get back to you as soon as I’m able.